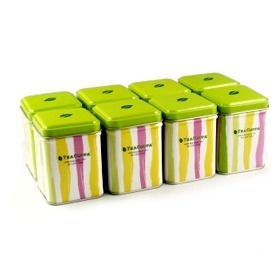 8 Tea Sampler Set consists of 8 small canisters of different teas. Each canister can hold from 1 oz to 2 oz of tea. 8 Tea Sampler Set is a great tea starter set for someone who wants to living the healtier way. Teas: Daye Oolong, Tie Guan Yin, Pearl Jasmine, High Mountain Green, Lychee Black, Pu erh, Chrysanthemum, Bai Cha. Another collection of great gifts too.